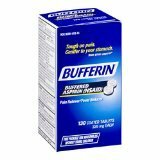 Bufferin Aspirin Pain Reliever 325 Mg 130 Coated Tablets. Item Number. : DB10118160.